I'd slow this world down. 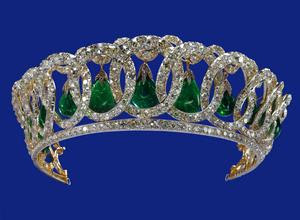 I'd only want it ( the crown....really a nice tasteful diamond tiara is much more flattering for my face..) for a day...probably less.. I"d insist on a chance to stop, and look and breath and be still. Can you tell things are a bit stormy for me right now? Outside, it's a beautiful day. This storm is of my own making. Now is when I should be writing..but instead all I want to do is duck and cover. So my one and only decree as a good Queen is... "Seek shelter. This too shall pass." I'm sure there are many, far better suited for the crown than I.....Find them over here. PS...I must add that I would make full use of the Royal WE...as there are several people living in my head and this would be the one time when I openly could admit this..without fear of retribution. I'm sure you'll look quite fabulous in that crown - or any crown. As for the "seek shelter" bit, I've been feeling that way too. But sometimes these storms are necessary to pave the way for shiny new beginnings - perhaps ones in which wearing diamond tiaras are couraged. Yes, your Royal highness, he says bowing low. "slow and easy does it. As you wish." We need to slow down and let things pass. Oh, we do love your Royal We. We enjoy it very much. I hope you find the shelter you're seeking. Your Royal WE: You deserve this crown. Take it. We, too, (the five or more of us who live in my head), are seeking shelter...and understand this "duck and cover" mode totally. The royal WE is must too! Each Penny Has Two Sides.